I haven't really gotten on the fairytale retellings bandwagon. Not because I don't like fairytales, but I just haven't been super excited to read a story that I feel I already know the main narrative - adapted or not. 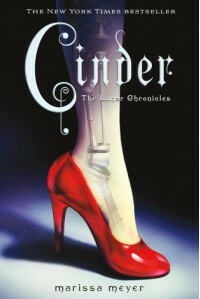 But when Jessica @ Rabid Readslisted The Lunar Chronicles as one of her top five favorite young adult series, I knew it was time to read Cinder. And I'm so glad I did! The world is incredible, the characters so vivid and real, and I do NOT know the main narrative. Cinderella has been entirely reinvented to the point that I almost don't recognize it! Rebecca Soler is a new to me narrator, but after listening toCinder I know that she will be one of my go-to narrators from here on out. She brings characters to life with the incredible ability to not only make them distinct from one another, but with personality that seeps out from her way of reading them. It was easy for me to forget that I was listening to one person reading several parts - or that I was listening to a book at all. I particularly loved the way she did the different robot voices - they had a robotic quality and yet were distinct from each other too. I wonder if she used some sort of voice altering technology or if she's just that good. Either way, I definitely recommend listening to this series. In a way you already know the characters if you're at all familiar with Cinderella. And yet, you REALLY REALLY DON'T. You've got Cinder, who's living with her wicked stepmother and stepsisters. Except that one of them, Peony, really isn't wicked at all. In fact, I seriously fell in love with this character, who despite being taught to hate Cinder, has too big of a heart to hate her. Even though Cinder is a cyborg. Yep, you read that right. Cinder suffered a serious pod (read: car of the future) accident when she was a young child that should have killed her. But science saved her by fusing her biology with machines. So she has metal hands, and central nervous system run by a computer, and metal feet - including one that's a bit too small to support her weight. Cinder is a mechanic - made the best in New Beijing due to her Cyborg abilities. She doesn't advertise that, though, because Cyborg's are hated by most. Considered sub-human. And with the plague (not the Black Death of the 14th century, but a new plague of this future world) killing thousands, cyborgs are being drafted through a lottery system for medical testing. So no - cool as it seems - being a cyborg is most definitely not a good thing. And Cinder's step-mother, Adri, reminds Cinder of her inferior status on a regular basis. Unlike the fairytale, where the stepmother married Cinderella's father and brought her own two children to the marriage, Cinder is really truly not part of the family. Adri's husband traveled to Europe and brought Cinder back, without really explaining to Adri why - and then died from the plague almost immediately after. Adri blames Cinder for her husband's death and, while I never grew to like Adri, I did at least feel a bit sorry for her. Then you've got Prince Charming - in this case, he's Prince Kai of New Beijing - and he shows up at Cinder's booth needing an android repaired. He's been told she's the best mechanic in New Beijing and he's surprised to find such a young girl. I loved Prince Kai - who thankfully is much more complete than in the Cinderella story. He's a complex young man, struggling to deal with his father's (the Emperor) illness (he has the plague) and complex relationship with the Lunar Queen (as in the Queen of the moon people...yep, I said moon people). He has a kind heart, strong values, and a real sense of responsibility for his people - to the extent of taking great personal sacrifices for them. He's a prince you want to love and to get the girl. My favorite character in all of Cinder, I think, is Iko (not sure if that's how it's spelled...audiobook disadvantage). She's Cinder's android with a "personality flaw" and I ADORED everything that came out of her mouth. She's quirky, not quite aware of things like sarcasm and yet seems so HUMAN. She's really Cinder's best friend and would do anything for Cinder. Okay - I seriously couldn't shut up about the characters, so I'll try to be a bit more concise about the story. What makes this story brilliant is the world. It's inventive and complex and so incredibly well established in this book - all while remarkably avoiding info dumps and keeping the plot moving. We're in our own future and some BIG changes have occurred. Not only do we now have cyborgs and androids and pods (instead of cars) but a whole colony was established on the moon. These people changed and became Lunars - a whole entire civilization ruled currently be a pretty fantastically horrible woman, the Lunar Queen. Lunars have a kind of magic - or, more accurately, the ability to manipulate bioelectric energy. This makes them a particular threat to humans - as they can not just shift perception of reality, but control behaviors. And the Lunar Queen wants to marry Prince Kai - as the ONLY way she is willing to establish peace with Earth. The threat of the Lunars - and particularly the Lunar Queen - is complicated by the threat of Plague. There is no cure or way to prevent a person from catching it - no vaccination. It strikes unexpectedly and the sick person is sent to a camp, where they are given care away from the populace, until they die - typically within a week. If they aren't near there family when the plague appears, they will never see their family again. Their family will receive updates as the person passes through the different stages, until finally they are notified that they are dead. The Plague is wiping out huge parts of the populace and Prince Kai - along with the other world leaders - is struggling to find a way to save his people. Cinder gets caught up in both of these plots - in ways that I don't want to tell you because it's part of the fun of reading the book - but it's exciting and kept me enthralled from beginning to end. The only reason I'm giving this 4 instead of 5 stars is a twist towards the end that I really didn't like. I may be one of the only ones, but IMHO, it hurt the story. Not enough to keep me from loving Cinder and excitedly requesting Scarlet from the library!